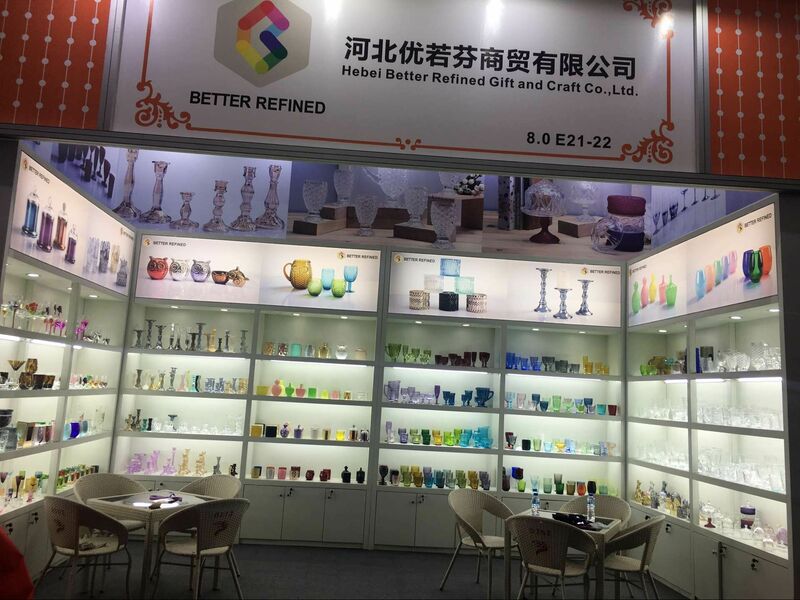 Hebei Better Refined Gift And Craft Co., Ltd. attended the 122th Canton Fair with the booth 8.0E-21-22. We showed our special glasses of glass drink wares including glass Tumblers , Wine Glasses, Mixing Glasses, champagne glasses, water glasses, Shot Glasses, various Glass Jars including Candle Jars , food jars, Candy Jars , Glass Candle Holders including Candlestick Holders, Tea Light holders, votive holders and Pillar Holders, Glass Plates and Glass Bowls , Glass Ring Holders, Glass Napkin Holders and other glass decorates. Many of our old customers visited us and placed the new orders with us, and we also meet many new customers to check and select their interested glasses. We mainly take the hand-pressing and hand-blown technology, our clear products have the best transparency(just like crystal), and we also can produce the primitive color, sprayed color and do hand-drawing. We can produce the items strictly according to your design, and also can print or engrave your logo on it. Our qualities are the top-grade in the market, and we would like to build the win-win and long-term business cooperation with you by our high quality, competitive price, elegant style and best service. We sincerely welcome the friends all around the world to visit us and contact us, let's develop together.